For 40 years, C.R. 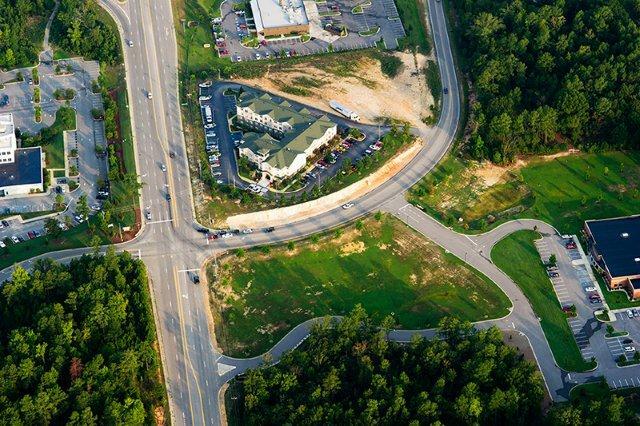 Jackson has proudly served South Carolina as a leader in the site development and heavy highway industries, providing asphalt paving, land clearing, storm drainage, and roadway construction to residences, businesses, and municipalities. For 40 years, C.R. Jackson has proudly served South Carolina as a leader in the site development and heavy highway industries. Founded in 1972, C.R. Jackson initially focused on land clearing, grading, and utilities (such as storm drainage) in the Midlands of the state. The scope of work that internal forces could complete grew to include asphalt manufacturing and asphalt paving in 1989 with the purchase of the company’s first asphalt plant. This expansion combined with the existing culture of safety, loyalty, and honesty put C.R. Jackson on track to become one of the state’s premier total site contractors. Today, C.R. Jackson offers its clients unmatched industry experience and a complete site service package, including design-build projects, land clearing and grading, water and sewage installation/storm drainage, roadway construction, and asphalt manufacturing and asphalt paving. One of the key components of our success has been the ability to hire and retain a very talented and knowledgeable workforce. On average, C.R. Jackson’s field superintendents have worked with the company for 14 years; at the project manager level, the average length of employment increases to 20 years. With this type of dedicated operational staff, C.R. Jackson brings considerable experience and industry knowledge to every project, regardless of size and scope. From land clearing and grading for a new subdivision or school to tackling a heavy highway infrastructure project for the SCDOT, C.R. Jackson is the contractor of choice in South Carolina. Convenient office locations in Columbia, Darlington, and Myrtle Beach enable the company to serve clients all across the state. Additionally, C.R. Jackson operates six asphalt plants throughout South Carolina – these facilities allow the company to manufacture asphalt for its own projects as well as for purchase by local municipalities and third party asphalt paving contractors. C.R. Jackson’s commitment to its culture of safety, loyalty, and honesty is the cornerstone of all interactions with employees, owners, and vendors. It is this approach to business that distinguishes C.R. Jackson from the field – our goal is to maintain positive relationships with all points of contact to ensure a lasting relationship with each customer while delivering exceptional projects. Contact C.R. Jackson today to discuss your next project.